Welcome to the latest addition to my series! I hope you enjoy! Today, I’d like to share with you my opinion of the Seven Dwarfs Mine Train. This family coast can be found at Magic Kingdom Park at the Walt Disney World Resort. It is the last attraction to open in the New Fantasyland area of the park. The mine train is a fun roller coaster for the whole family, since the height requirement for this ride is only 38 inches. It sways back and forth with unique dips and turns and has a great scene in the mine with the seven dwarfs and a room full of jewels. You will begin by going through the super fun queue that has interactive games to play while waiting. The first is a jewel match game. The jewels are running in the stream & you have to pick them out & drag them to the right color & shape. The second game will be just before you enter the indoor portion of the queue. This game has wooden carved animal heads. When you place your hand under them, the head will light up, a musical note will sound, & a stream of water will fall (don’t worry…only your hand gets wet). The animals have different colored lights & notes. Enjoy making up a song! The last game is just as you enter the cottage. You will see seven wooden barrels that you can spin. As it spins, the barrel will light up the ceiling with one of the seven dwarfs dancing. If you spin all 7 at once, Snow White will appear in the center to join the party!! The games are really fun & made waiting in the line less boring. Now it’s time to get on the ride! You will board the ride vehicle in pairs. It takes off pretty quickly & goes through some twists & turns. The mine vehicles sway & if you move back & forth, you can make them sway more. Although it moves pretty quickly, the turns & dips are not big at all. 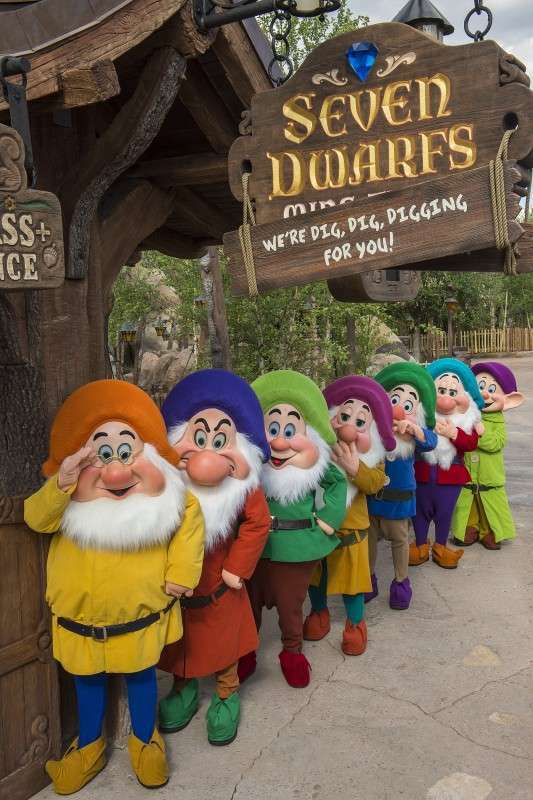 About halfway through the ride you will enter the mine with the dwarfs. It is beautiful here! The animatronics are amazing! I like Dopey playing in the jewels. The you go up a big hill as the song “Heigh ho” begins. The biggest drop comes next with a few more turns. The ride ends with a ride beside the seven dwarfs cottage & you can see Snow White dancing with the dwarfs. You will also see a visitor ready to knock at the door….. In my opinion, this ride is okay but not very thrilling. I think younger kids will love it as a first coaster due to the small drops & slower speed ( as compared to Space Mountain). Those seeking a thrilling coaster will be disappointed. Try it yourself & let me know your opinion!! Next Post SeaWorld and Busch Gardens Mobile App Gives You More Freedom In The Park!